Sally: The Epic React was perhaps my favorite new shoe of 2018: light, cushy, responsive, quick, good looking, comfortable, and basically fun to run in. I was looking forward to the update, but fearing that Nike might mess with success. “If it ain’t broke, don’t fix it” applies here, and we Epic React lovers will be happy that Nike did not effectively change anything at all! Hope: I was a big fan of the OG Epic React so I shared Sally’s nervousness that big changes in the ER2 would mess with the original’s success. There are some differences between the models, but they’re mostly subtle. I had to run with the OG ER on one foot and the ER2 on the other to really distinguish them. I expected my outing in the mismatched pair to feel weird, but the shoes are so similar that I really had to pay attention to spot the changes made in the update. Sam: The Epic React 1 was one of the most disappointing shoes of 2018 for me. While very light, well cushioned for its weight, sleek, and elegantly simple in design it had one of the very few uppers in recent memory which literally got in the way of transitions, pressing hard over the top and side of my midfoot with the heel counter rough and a bit sharp on the achilles. The ride itself was quite dull, labored and lifeless for me. So while on the surface the Epic React 2 looked very similar, boy was I surprised when I ran them. Comparing one on each foot,upper tuning eliminated the top of foot pressure, the toe box is ever so slightly roomier and the ride noticeably smoother and easier to transition and even I think a touch softer, less dense, and bouncier. Sam: While much improved in run ability due to the upper and slight midsole changes still somewhat muted dull transition and overall run feel for me lacking in decisiveness and snap. Sam is the Editor and Founder of Road Trail Run. He is 61 with a recent 3:40 Boston qualifier. Sam has been running for over 45 years and has a 2:28 marathon PR. These days he runs halves in the 1:35-1:41 range and trains 40 miles per week mostly at moderate paces in the 9 minute range. He is 5'10" and weighs about 165 lbs. Sally Reiley started road racing in her mid 50's. Since then she has run the Boston Marathon five times and Chicago once with a PR of 3:29 in 2017 in Boston, in the heat. Sally: It looks like last year’s shoe with a few slight modifications. Nike trimmed the heel cup, but the shoe fits, feels and performs the same for me. They added a bigger swoosh, but it doesn’t seem to have any functional purpose. They added a little subtle color to the midsole. Basically it looks and feels the same as last year’s shoe. I did have to size up half a size last year. The Epic React is the only shoe I have had to do that in. It is definitely a snug-fitting shoe by design, which works fine for my narrow foot, but I found the toe room cramped lengthwise after a few miles. I tried both my true size and the half size up this year, and went with the larger. But I do feel as if the #2 version has a bit more fabric around the top of the foot and at the collar, so it might accommodate a wider foot than last year’s. My first impulse was to leave the shoe on all day. Hope: Only the most eagle-eyed observers would spot the visual changes in the ER2 over the OG ER. Slightly thicker swoosh overlay, split (rather than single-piece) eyestay, plastic heel clip instead of an full plastic heel counter overlay. Nike has encountered a “good problem to have” in that the OG ER was such a great debut that it left little room to make the kinds of sweeping changes that would draw a lot of attention to the update. Case in point, I wanted to try the ER2, but didn’t feel motivated to buy it because the small changes didn’t make for a compelling argument as to why I needed the new version. The fit is somewhat looser than the OG ER, especially through the midfoot. This is welcome as having a little extra toe box height makes my toes feel less claustrophobic. The external plastic heel clip is a non-event. It is aesthetically more pleasing. I like a clean, simple shoe and the heel clip is smaller than the stiffening overlay on the OG ER. Plausibly the heel hold is more relaxed in the ER2, but I’m not positive that’s the case as my feet felt plenty secure. Sam:Trying them on I immediate thought, now that is an improved fit. Gone was the very snug over the top of the instep pressure as well as arch area upper snugness. I noticed a slightly more relaxed toe box fit with a touch more overhead room back of the toe bumper. Finally the slight irritation I had in version 1 at the rear center of the achilles was gone with the lower more minimal heel counter overlay. 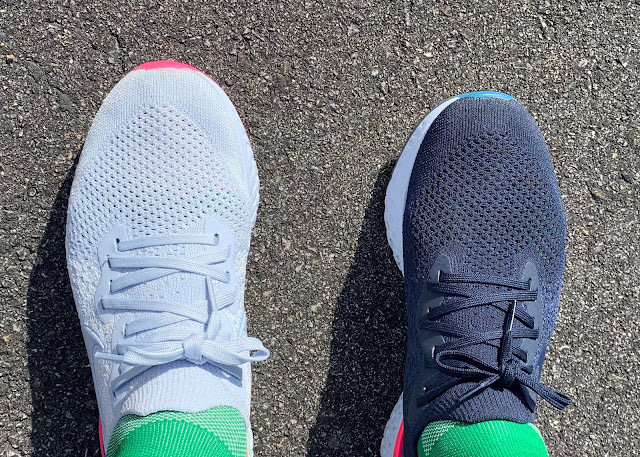 Running them one on each foot with my wider left foot in the Epic React 2 and narrower left foot in the Epic React 1 pretty much instantly confirmed that the sum of all these subtle changes made for big improvements for me over what I felt was one of the worst fitting uppers of 2018 for me and I ran in well over 80 different shoes most without any issue, so that is saying something. Now and and in comparison to other 2019 Nike uppers such as the Zoom Fly Flyknit 2 and Vaporfly 4% Flyknit it is one of the best fitting stretch knit type uppers to date form me. None of the low and pointy toe box fit here. In version 1 I was true to size and struggled with the low snug volume at mid foot and to a much lesser extent a touch of shortness up front. Here, also at true to size, and while still a snugger performance fit I would not size up. Those with narrower feet may struggle with lockdown sizing up. Those with wider feet (as my left) may get away with it. Of course sock thickness can always play a role in adjusting for between sizes. Sam: The upper is Nike’s Flyknit a single piece and is overlay free, with the exception of Swoosh which provides some clever mid foot to heel structure and lockdown to the always tricky in knit uppers mid foot to lace up to heel area in such uppers. The toe box has slightly more volume back of the toes and the knit itself is very slightly less rough and softer the touch. The most significant changes for me are at midfoot. The now split lace eye stay I think adds flexibility, the softer broader laces allow a looser lacing yet with decent security, and there is clearly a bit more volume down low on the medial side. These subtle and effective changes eliminate the pressure over the top of the foot and low down snugness I felt in v1, so much constriction that the upper felt like it impeded my transitions off of midfoot to toe off, truly. Sally: Nike split the lace holder, but I honestly didn’t feel that added any flexibility. As noted above, there seems to be a bit more fabric in the tongue. I have a narrower foot. The Flyknit upper has the same sleek, sock like silhouette that had me loving the aesthetics last year. Hope: I basically agree with Sally. The ER2’s upper looks just like the ER1’s upper with the exception of the eyestay and the thicker swoosh. I don’t have a measurement for the looser midfoot feel (more fabric or a consequence of the split eyestay? ), but it’s the only meaningful difference I noted. I have a preference for ultra-thin running socks, but a switch to more conventionally thick running socks (especially Nike Elite Running Cushion socks) made the shoes feel less loose. Not sure if this belongs in this section, but I have to call out the laces which seem slightly thicker and slicker in my ER2 pair. The laces on the light gray “Pixel” colorway seem shinier than the laces on the OG ER and on the other pairs pictured here. They came untied for me multiple times while running, always from double knots. I had to really crank down the knots to get them to hold. Not a huge deal, but definitely annoying. I was underwhelmed with Epic React despite the lightweight and great cushion. The run feel was dull, dense and sort of lifeless with a particularly ponderous mid foot (and it wasn’t just the upper constriction) and lacking pop on toe off. 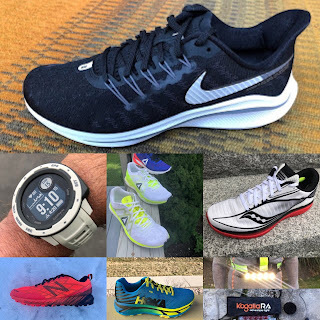 I much preferred React when combined with the carbon plate in the Zoom Fly Flyknit and for sure its implementation in the new Kiger 5 (RTR Review) where on trail such dense but light and stable foams are what you need. Well, well things are significantly improved in Epic React 2. Run side by side, one on each foot, I immediately noticed that the React 2 was slightly softer, slightly less dense, and had more bounce than version 1 did. Of course the new upper tweaks also help, but isolating heel and forefoot feel from mid foot I could clearly feel welcome differences. I finally enjoyed the midsole. Nike does not say anything is changed in the midsole but I feel something has and my v1 have not more miles on them than my v2. I do think the midfoot feel and toe off is still somewhat ponderous and dull and maybe changes to the data driven overall midsole geometry and outsole could improve this. For example, real carbon rubber and more of it with deeper flex grooves which seem to help the Odyessy React 2 overall feel and pop. Hope: The midsole seems somewhat softer in the ER2. That may be because of how it interacts with the slightly looser upper or it could be because the durometer of the midsole foam has genuinely changed. I couldn’t perceive a difference in-hand -- poking the ER2 midsole feels like poking the OG ER midsole. To step away from the OG ER as a frame of reference, the ER2 midsole feels bouncy, yet reassuringly firm. It’s not mushy or sloppy and gives excellent feedback with each footstrike. 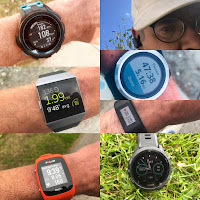 I prefer to feel connected to the ground in running shoes (I want my body to be protected from the hazards of pavement, but I still want to feel the pavement to an extent) and the ER2 delivers that feeling. Sally: Last summer I found that the Epic react was also a great boat shoe! I do a lot of big boat competitive sailing, and I was not the only crew member who preferred this shoe for deck work over any Sperry model. The Epic React is comfortable and supportive with a grippy and non-marking sole: the perfect boat shoe! Hope: Not sure what Nike did differently here as the tooling of the ER2 is identical to the tooling of the OG ER, but they did fix a small, but annoying issue with the OG ER. When walking on smooth surfaces, I found that the OG would make a clicking sound, as if both of the rubber pieces was flexing in and out as my feet made contact with the ground. I didn’t observe this in the ER2. Again just to go over the ER2 on its own merits, the outsole on this model is minimal. Strategically placed pieces of rubber reinforce high-wear areas in the forefoot and midfoot. These rubber pieces are both perforated and siped for enhanced grip and flexibility. The part of the midsole that makes contact with the ground features the same grooves as the sole pieces, just perhaps a bit deeper. This combination of rubber and high-durability exposed foam makes for a grippy outsole. I appreciate Nike’s choice to minimize the outsole rubber to save weight. Sam: The crystal rubber outsole looks great but I would prefer real rubber and more of it up front extending further with more segmentation to allow a snapier toe off. 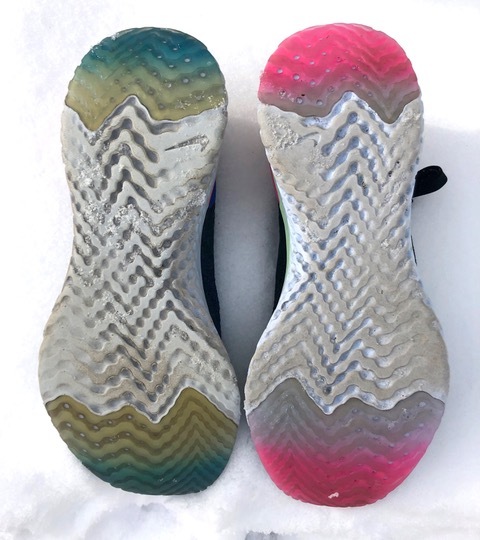 Crystal rubber type outsole tend to lack pop. Hope: Yep, no need to belabor this point, but it is the biggest reason to add this shoe to your collection. The ER2 is wicked smooth, fast-transitioning, and just plain fun to run in. When a shoe looks this nice and feels this good to run in, I can’t help but love it. The somewhat softer feel of the ER2 over the OG ER was noticeable to me only when I wore one shoe of each model simultaneously -- it’s that minor. It significantly doesn’t change the ride character. Sam: I agree with Hope the ride is slightly softer and for me less dense and somewhat bouncier. Along with the upper not getting in my way, the ride is significantly improved making the Epic React 2 a solid yet very light and well cushioned training ride. While it looks great it is not the most exciting or dynamic ride but for barely 8 oz it has lots of substance for grinding out daily miles. I loved the original, and I love this updated version of the Epic React. Nike really didn’t change anything, thankfully. It is a light, bouncy, fast and fun shoe that fits snugly and looks chic. It can handle all paces and yet loves fast. I can wear it all day post run and my feet are happy. One can save money and buy the OG ER1 and not miss any significant updates/improvements. I’ll echo what Sally said. Nike refined the Epic React in the ER2, but they didn’t make meaningful changes. That means that if you were waiting for the ER2 to fix something you didn’t like in the OG ER, then you’ll likely be disappointed. If you loved the OG ER, you’ll almost certainly like the ER2. But if you can get your hands on a discounted pair of the OG ER, I can’t tell you that you should leave them on the shelf in favor of the ER2. I recently took a field trip to a local running store where I saw other colorways of the ER2 on the wall. They’re drool-worthy. Just super, super smooth and pretty with simple colorways. If you want a somehow even better looking version of the Epic React (the OG is a great-looking running shoe and one that I’m happy to wear casually), you’ll want to pick up the ER2. Otherwise, Nike has not made a case for replacing a great shoe with a new but equally great shoe. -0.1 for doing away with the itty bitty reflective stripe on the heel of the OG ER -- reflectivity is an important safety feature for many runners! Subtly refined and improved the Epic React on the surface looks unchanged yet for me went from a sharp looking, light, but dull and ill fitting shoe to a fine daily trainer. I marvel that the entire shoe is made up of a total of about 14 parts by my count, laces included, so a triumph of simple design and reduced labor and waste to build. -0.25 for somewhat dull flat mid foot, potentially a midsole as outsole geometry issue. Hope: As the adage goes in the sneaker community, “patience saves pockets.” You’ll save money by buying the older version of the Epic React. It’s just as good as the update. If you have to have a certain color, buy the ER2. They’re equally excellent. But for cost alone, I’d go for the OG ER. Sally: ER2 looks, feels, and performs just like the ER1. Two versions of the same shoe. Sally: Now we are comparing the ER2 to my FAV training shoe. I love the roomier toe box fit, the quick ride, and the forward boost of the ZoomFly FK. The ER2 is a fun shoe, but the Zoom Fly FK takes the fun to a higher level. Sam: While Zoom Fly also has a React midsole, we also have a carbon plate embedded in the Zoom Fly and the overall platform (and upper) is narrower and more performance oriented. The Epic React 2 is more stable with a more voluminous upper, particularly upfront and has better heel hold. On the run, the Zoom Fly is a faster shoe for me but less stable at the heel and thinner feeling at forefoot, so more faster days than every day where Epic React 2 slots in for me. The Odyssey React 2 has a much lower front of toe box and includes a touch of stability along with a fuller coverage real rubber outsole yet weighs very close to the same. It has more snap than Epic React 2. If its upper works and it barely does for me, unlike Epic React 2's which does just fine for me it is a better choice if you want a slightly more stable ride and more snap. Beware its upper which is quite warm and not very breathable towards the rear. Sam: A huge contrast here not only between shoes but within shoe. Heavier, the Vomero combines a very stable dense heel with a flexible snappy forefoot, front and back are in sharp contrast, whereas Epic React 2 has basically and somewhat more boringly the same feel front to back. Copious amounts of super gripping (trail worthy) rubber on the Vomero also contrast with the Epic React’s mere patches. The Vomero’s engineered mesh is roomier and broader. I prefer the Vomero’s strong character to the relatively bland but oh so light Epic React 2 ride. Hope: I am coming around on the Pegasus Turbo, truly. But It’s not a great fitting shoe and the upper is too padded for an uptempo shoe. The sleeker ER2 is my choice. Sally: The Peg Turbo TTS scrunches the tops of my forefoot after only a few miles. I would lose big toenails in a marathon in that shoe, guaranteed. I prefer the fit of the ER2, but love the ride of both. Sam: The Turbo has an awkward toe box with non stretch materials with the racing stripe not being friendly with all toes. Zoom X foam is superior to React in its silky softness and superior energy return but in the Turbo with its narrow heel landing, no carbon, no Air Zoom or other taming elements it is soft and not particularly stable. As a recovery run shoe it is fantastic but for me only in limited doses while the not quite as exciting feeling Epic React can for sure be a daily companion. Hope: Both great shoes. The ER2 is bouncier and more fun, but I think the K10’s more relaxed upper is more forgiving over the long haul. This is close, but I’d choose the K10 even though I gave the K10 a lower score in my review. There’s less that’s “wrong” with the ER2, but I still like the K10 better. Sally: I am in the same camp as Hope and like the Saucony Kinvara ALOT. The K10 has a much more generous upper (I love Hope’s apt use of the word “forgiving”) than the ER2, but the ER2 has more bounce. Love them both in rotation. Sam: Agreeing with Hope and Sally, the K10 has a superior upper, a monofilament type mesh which I see as going to replace sometimes tortured knits. I also agree the Epic React has more bounce and for me can be a daily trainer while the K10 is more responsive somewhat firmer and is more a faster days and race shoe. Hope: It’s a good model to compare to the ER2 because of its similar use of limited outsole rubber and its simple upper. The Beacon was my #1 trainer of 2018 and it’s more flexible and snappier than the ER2, so it’s my pick. 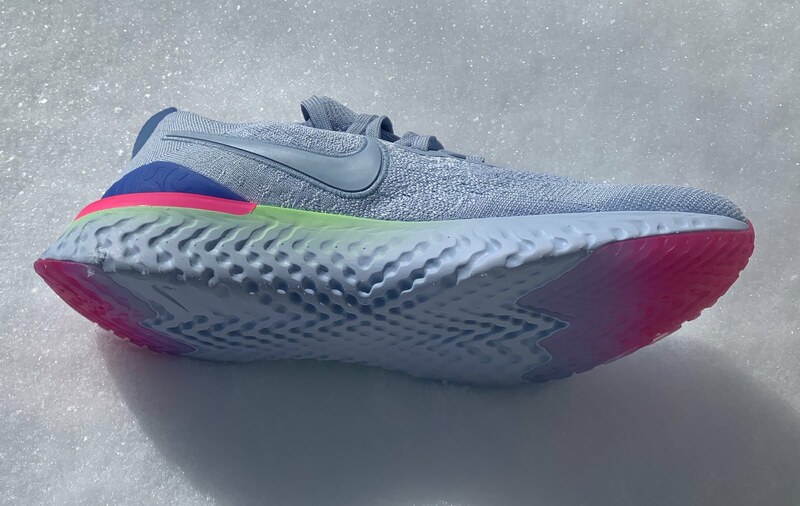 Sam: More cushion from 2mm more heel stack height in the 10mm Epic React which is welcome and 2mm more forefoot stack in the 6mm drop Beacon which I don’t really notice in comparison to Epic React’s well cushioned forefoot. I actually prefer the Epic React more secure and stable upper. Similar to the Kinvara comparison, the Beacon is more performance trainer racer, the Epic React despite its super light weight more trainer. Hope: The SR2 has a lower stack height and more flexible sole. I love the breathable upper that molds to my foot. Also factoring in the wallet-friendly price, the SR2 is the clear winner for me. Sam: Agree with Hope with the cavaet that the Epic React is considerably and noticeably lighter. The Sweet Road has more character, in similar fashion to Vomero in having a very stable heel and agile forefoot. Sam: A newcomer on the scene, the $100 yes $100 so $50 less the Epic React, Forever Floatride Energy also has a new age “super foam” and for my taste a superior one to React. Springy and lively there is zero dullness in the Forever’s ride. Not quite as well cushioned and or mellow and an ounce heavier with a basic but effective mesh upper it sits exactly on the line between performance trainer/racer and trainer but leans performance. Definite lean to Forever for me. Hope: Another tough one. The Razor 3 has better range for me. The R3 is better suited to racing and uptempo training as it feels ultralight on foot. Given its more minimal upper, the ER2 feels somewhat less balanced, with the vast majority of the shoe’s weight coming from the midsole. That makes it feel less light to me on foot. Both great shoes (seriously, when the ER2 is falling short in these comparisons, it’s losing by a hair), but I prefer the R3. Sam: The Razor has a far more exciting ride but is for me far more shorter racer than trainer as the Epic React is. Hope: Sock-like upper vs. sock-like upper. The ER2 does it better, with a more secure-fitting upper paired with a softer sole. Some colors already on clearance! Thanks for reading and commenting. Unfortunately we don't yet have the exact stack heights but it is a 10mm drop same as Epic React 2. I find the Epic slightly more cushioned especially at the forefoot but not nearly as lively as the Forever Energy. 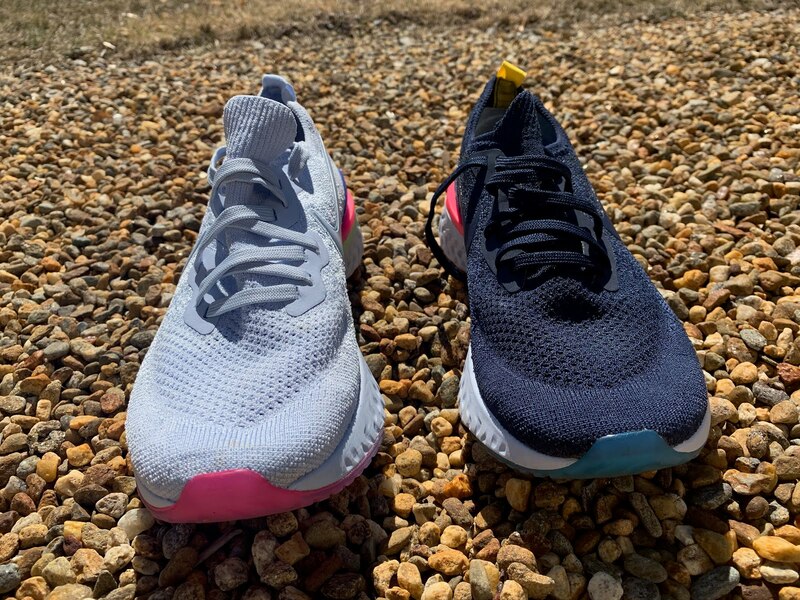 In terms of comparison to Beacon both Epic React and Forever are more cushioned at the heel, mainly as they have more stack there although don't have the exact Forever heel height with Beacon and Epic feeling about the same in terms of the cushion at the forefoot. I would select the Epic if you want a steady very light daily trainer and the heavier Forever if you want a slightly more performance oriented feel especially up front. The Forever has considerably more outsole rubber than either of the others. Select Beacon if you want a more relaxed upper and more natural kind of feel, a bit harder to tame though. Looking to pick up a shoe to rotate in with the Beacon for daily training and recovery/slower runs. I tried the Zoom Fly FK and liked it, but felt it may be a little much for the purpose; I'm thinking something like the Nike ER2 or the Ride 7 would be good (maybe the Vomero 14 or Floatride Energy). I'm a little heavier compared to most runner (180lbs), and typically am only running in the 9:00 mile pace for these runs, so the cushion is nice. Which would you guys recommend for this purpose, having tried them all? Thanks for the answer and info. I am going to order one each of the Energy and Ride 7, as it seems like one of those should work for my slow and lazy runs. Both of them are such good deals (Reebok has 30% off right now), I may end up keeping both. Again, thanks, and I appreciate everything you have on your site!